After winning Students’ Union of the Year last year, Middlesex Students’ Union are proud to announce that we have won the NUS Representation & Campaigning Award 2018. 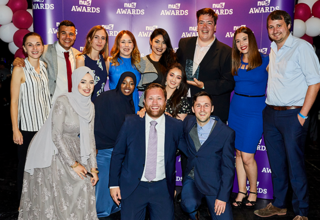 MDXSU was one of eight students' unions from across the country to be shortlisted for the National Union of Students' award, with the results being announced at the ninth annual NUS Awards ceremony in Birmingham on Wednesday 4 July. This national award recognises our Refugees Welcome campaign, which began in 2015. MDXSU worked with Citizens UK and local organisations to convince Barnet Council to become one of the first councils in the country to join the resettlement scheme, with 50 vulnerable refugees being relocated to our local area. Over the past two years, MDXSU has continued to work in partnership with the local community and the University to support the resettlement and ensure its success. This has included working with Middlesex University to provide fee waivers for refugees, giving four students the opportunity to study at MDX. We are hopeful that a fee waiver program for those fleeing war and conflict will continue to transform the lives of people who need it most for years to come. “It has been incredible working side by side with the refugees, and achieving our goal of giving them access to education. I feel this campaign was not only successful for our new students, but I think the whole organisation feels richer from spending time with the refugees. I hope this campaign also encourages other Students’ Unions to do the same – to not only welcome refugees, but also to break down the barriers to education." This award comes just one year after Middlesex Students' Union won Students’ Union of the Year at the 2018 awards ceremony. This was given in recognition of our commitment to continual improvement, with judges stating that our student-led activity and representation work “matched [our] ambition to become the most innovative, inspiring and inclusive” students’ union in the UK. We would like this opportunity to thank everyone who has supported this work over the past three years. We would like to share this award with the students, staff and local partners who have been involved in this campaign, and of course with the new students who have been able to attend our university as a result of it. We would also like to congratulate the other #NUSAwards winners this year - truly inspired by the incredible achievements our fellow students' unions have achieved.